The Orange County Regional History Center will host Genome: Unlocking Life's Code, an exhibition from the National Museum of Natural History. A multimedia exhibition, Genome explores how the genomic revolution is influencing people’s lives and the extraordinary impact it is having on science, medicine and nature. The exhibition looks at the complexities of the genome—the complete set of genetic or hereditary material of a living organism—and chronicles the remarkable breakthroughs that have taken place since the completion of the Human Genome Project 10 years ago. 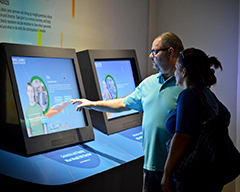 With cutting-edge interactives, 3-D models, custom animation and engaging videos of real-life stories, the exhibition examines both the benefits and the challenges that genomics presents to modern society.